Is a NAS drive worth it, or is it just another gimmick? Let’s find out. When it comes to choosing hard drives for a NAS device, many users may pinch pennies and make do with lower-cost desktop drives. Some are probably not even aware that desktop drives are not designed for closely nested environments like a NAS. With greater reliability, NAS drives are particularly suitable for a NAS environment. With the heat-resistant and anti-vibration design, a NAS HDD is tailor-made for a NAS server, providing 24/7 operation with higher speeds. A NAS drive solution may be a substantial investment in the beginning, but its high level of stability and reliability makes it cost-effective in the long run, which realizes a lower total cost of ownership (TCO) and a better return on investment (ROI). Continuous operation and RAID configuration are what makes NAS HDDs stand out from desktop HDDs. A NAS HDD is designed to run for weeks on end, while a desktop HDD can only read and write data for hours at a time. A NAS HDD is also built specifically for RAID setup. By combining multiple drives into one single logical unit, RAID configurations provide data redundancy, thus protecting data against drive failures. Storage capacity, speed, and performance are not the only deciding factors when purchasing a NAS hard drive anymore. An ideal NAS HDD should meet the following requirements: higher workload rate and Mean Time Between Failures (MTBF), thermal control and vibration tolerance, and add-on services. Desktop HDDs only operate when computers are on, while NAS HDDs can be up and running 24/7. Desktop HDDs are likely to fail under long-term continued operation, so you need NAS drives that are purpose-built for continuous operation especially in large NAS deployment. To ensure maximum uptime, you should take workload rate and MTBF into account. Workload rate means the amount of user data transferred annually (TB/yr), while MTBF refers to the average time during which a device functions before it reaches end of life. Generally speaking, the average workload for desktop HDDs is 55 (TB/yr), while you cannot even see MTBF on the spec sheet because continuous operation is not a concern when designing a desktop HDD. A NAS drive, by contrast, provides a higher workload rate and longer MTBF, ensuring greater durability and reliability. Take IronWolf Pro as an example. It offers a workload rate of 300TB per year with an MTBF of 1.2 million hours. Closely nested drives operating at the same time inside a NAS can result in vibration, noise, and heat. In addition, hard drives usually have high spindle speeds (RPM) so that disks can rotate at a faster speed and read data faster. Low spindle speeds create less vibration and noise, but they become a hindrance to achieving better read/write performance. Vibration is especially undesirable in multi-bay or rack systems, for it hampers stability of hard drive operation and even leads to data loss. With NAS drives, you can rest assured that you don’t have to trade off speed for quieter and cooler drives. Nowadays, NAS drive manufacturers have developed anti-vibration technologies to prevent drives from creating too much vibration and noise, while maintaining high-speed performance at the same time. For instance, every IronWolf hard drive is equipped with built-in rotational vibration (RV) sensors that can reduce vibration in multi-drive NAS systems, maximizing system availability and performance. Aside from performance and features, you should also consider added value that comes along with the drives you purchase. Select NAS drives that offer add-on services, such as warranty, drive health management, and data recovery services that are tailored to your needs. To prevent data loss, S.M.A.R.T (Self-Monitoring, Analysis and Reporting Technology) is usually employed to analyze 20 parameters and will send out a warning upon detecting imminent drive failures. 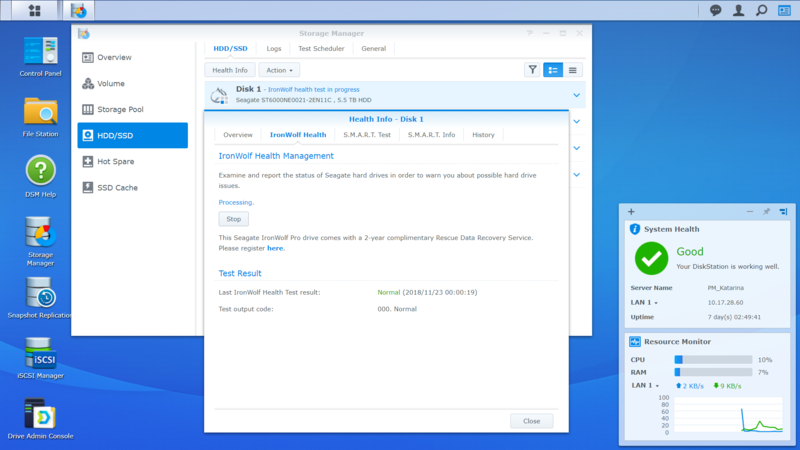 IronWolf Health Management (IHM) brings reliability to a higher level as it monitors hundreds of parameters with adaptive algorithms to keep close tabs on drive health status, ensuring a robust system environment. Should a drive failure occur, users will probably turn to hard disk data providers. It could be very pricey, and these rescue data efforts may still end up in vain. Therefore, a recovery plan included with your purchase will play a pivotal role in your choice of NAS drives. For example, Seagate’s Rescue Recovery Data Plan allows their users to seek professional help from global data recovery specialists in the event of catastrophic data loss. A NAS drive allows for 24/7 multi-user access, and its reliability is something we don’t want to miss. Don’t let hard disk failures, vibration, and heat commonly found in desktop drives become stumbling blocks to your NAS system. Bear the above factors in mind when purchasing NAS drives, and then hopefully you’ll find ideal ones that best suit your needs. Come share with us what’s on your NAS wishlist on the Community. You’re reading:Why choose NAS drives over desktop drives for your NAS?